Firefox users can move browser tabs to a sidebar so that the tabs are displayed vertically with the help of extensions such as Tab Kit. This at first may be confusing to users of the browser who always had their tabs aligned horizontally, but the benefits may make it worth their ewhile. Computer monitors nowadays are often wide screen displays, which means that you get lots of width and not so much height. Websites on the other hand usually limit the width of their contents, so that space remains untapped in the browser if you are running it in fullscreen or a large window. Moving tabs to the side not only makes available additional vertical space for the actual website, since the tabbar is no longer displayed in its original location, but also additional tabs before you need to start scrolling. A recent Australis demo document (pdf) highlights that Mozilla seems intent to add vertical tabs as an option in the near future. It needs to be noted that this is a mockup right now and not something that you can activate. 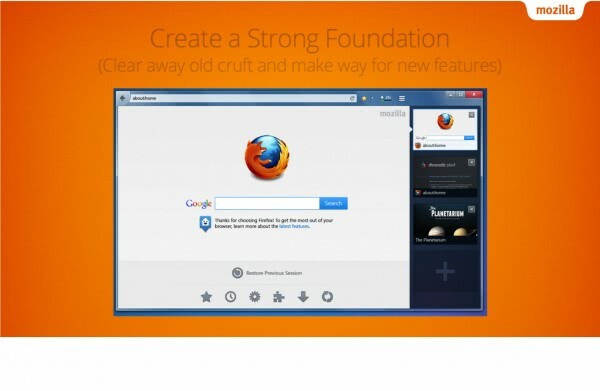 Still, it is likely that this feature will eventually make its way into a future Firefox version. The mockup demonstrates how vertical or sidebar tabs could look like in the browser. It is interesting to note that tabs are displayed as thumbnail images and page titles here. It is likely that tabs will only be presented this way if they do not exceed a certain threshold, as too many open tabs would either render thumbnails too small or reduce the overview over open tabs as you’d have to scroll a lot as only a certain number of thumbnail tabs fit on the screen at the same time. If you look closely, you will notice that the mockup showcases a different design than other mockups. This can’t be attributed to the moving of the tabbar alone, and is an indication that designs are not final yet either way. By the way, some of the other sheets of the pdf document linked above show other ideas and mockups that you may want to take a look at. You see the new about:home or new tab page here for instance. One interesting little tidbit here is that one mockup shows weather conditions on the screen. Could this be the integration of a speed dial extension-like feature that Opera supports for a while now? The Google Apps team just announced that support for Microsoft’s Internet Explorer 8 web browser will end on November 15, 2012. This falls in line with last year’s announcement that the service will only support the latest version of a web browser and the prior version. When a new major version gets released, support for the third oldest version is discontinued. Microsoft will release Internet Explorer 10 on October 26, the day the Windows 8 operating system is launched to the public. The new major version and Internet Explorer 9 are from that moment on supported by Google Apps, while Internet Explorer 8 support is dropped. This has implications for Windows XP and Windows Server 2003 users, as Microsoft has not made available Internet Explorer upgrades for their systems. While that does not mean that these users can’t access Google Apps at all, they will receive a message recommending to upgrade the browser. Since XP users do not have upgrade options available to them, they are in a predicament. As we announced last year, we support the latest version of Google Chrome (which automatically updates whenever it detects that a new version of the browser is available) as well as the current and prior major release of Firefox, Internet Explorer and Safari on a rolling basis. Each time a new version of one of these browsers is released, we begin supporting the update and stop supporting the third-oldest version. Organizations and individual users relying on Internet Explorer 8 may install the Google Chrome Frame plugin in the web browser to overcome the issue. Internet Explorer 8 is not the only browser that Google Apps is not supporting officially. Google is for instance not supporting any version of the Opera web browser, Internet Explorer 6 or 7, Firefox 3.6, Firefox 4, or any version of the browser lower than Firefox 14 with the exception of the Firefox ESR release. Users running unsupported browser versions may experience issues when using Google Apps. Presentations in Google Docs for instance do not display properly in Firefox 3.6, and Gmail’s new look does not work at all in unsupported web browsers. The move may provide Google with yet another option to market the company’s own web browser Google Chrome to Internet Explorer users. Punjab Chief Minister Mian Shahbaz Sharif on Saturday, July 07 2012, said that the PML-N always took concrete steps to ensure provision of comfortable, quality and economical traveling facilities to the general public. 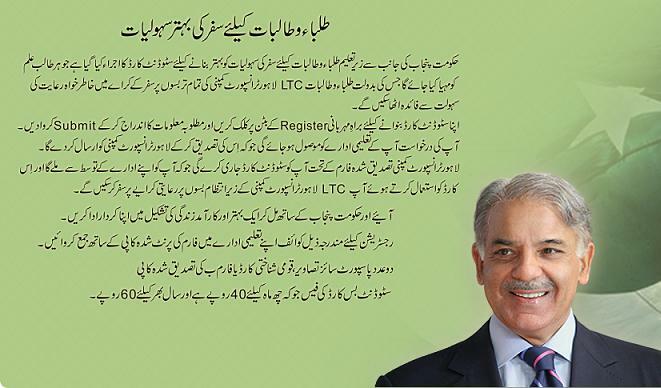 He was addressing the launching ceremony of Student Green Card Scheme, held under the auspices of Lahore Transport Company at the Chief Minister’s Secretariat here. Advisors Begum Zakiya Shahnawaz, Zaeem Hussain Qadri, Lahore Transport Company chairman Khawaja Ahmad Hasaan, Vice-chairman Mehr Ishtiaq Ahmed, Members Assembly, bus operators, parents, teachers and a large number of students were also present. 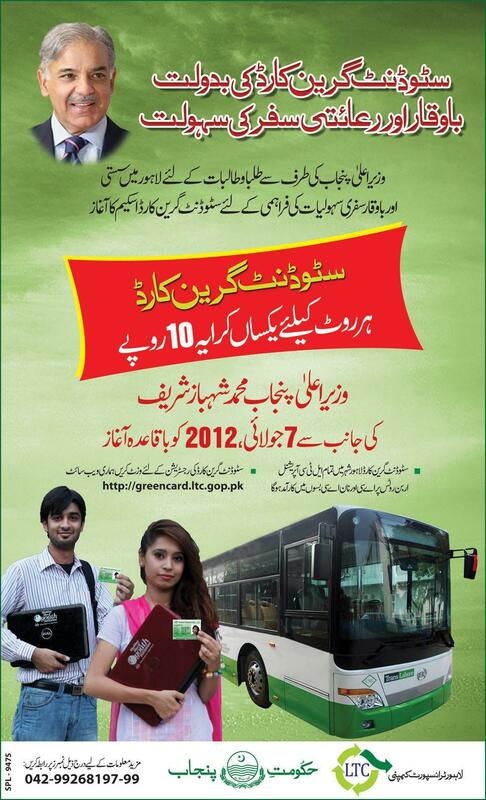 Addressing the ceremony, Shahbaz Sharif said that public transport system played a crucial role in the progress and prosperity of every society, asserting that the Punjab government had taken revolutionary measures to ensure provision of quality traveling facilities to the citizens by streamlining the public transport system on modern lines. He said the provision of best transport facilities to the citizens was the foremost duty of the state, but, unfortunately, the sector was neglected in the past. He said the government had introduced Green Card Scheme for the students of provincial metropolis, which would also be expanded to all cities of the province. Shahbaz Sharif said that the initiation of Student Green Card Scheme was a significant step towards ensuring socio-economic justice to the masses. As many as one 1,25,000 girl and boy students would benefit from the new scheme. You are currently browsing the archives for the NEWS & ANNOUNCEMENTS category.